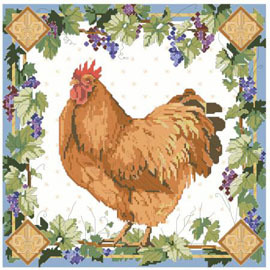 Our classic country French hen is lovely. She is fluffed up and proud to be standing in your home in all of her glory. The grapevine border is a perfect complement to the charm of this design. Fleur de lys symbols anchor each corner to make this an elegant and timeless design. Contents: Stitch Count 168w X 168h, Finished size on 14ct 12" X 12"